This nature preserve, owned by the Duchy of Cornwall and managed by the Nature Conservancy Council, English Nature and Natural England since 1961, is another enchanting place of Albion. To sit among the boulders covered in moss and the vibrant oak trees one is transported into other realms with ease. It is one of the highest oak woods in Britain and is home to a healthy population of adders. 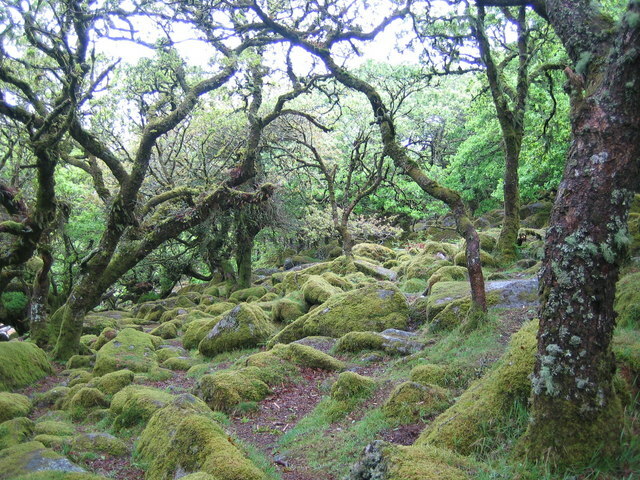 Around 7000BC an ancient forest covered Dartmoor but Megalithic era hunters began clearing the trees around 5000BC. Since the mid- 19th century it is thought that climate change is affecting the growth of the oaks quite dramatically. With warmer weather more straight oaks have developed and in the 20th century the average height of the trees has doubled. In 1620 it was recorded that the oaks were no taller than humans (who were also a good deal shorter then!). The Wild Hunt is associated with Wistman’s Wood in present day folklore and as one sits upon a mossy boulder it is likely you will see flashing movements in the periphery of your vision at this most mysterious of places.